Tromsdalen Church, also known as Ishavskatedralen (The Arctic Cathedral) was dedicated on November 19, 1965. 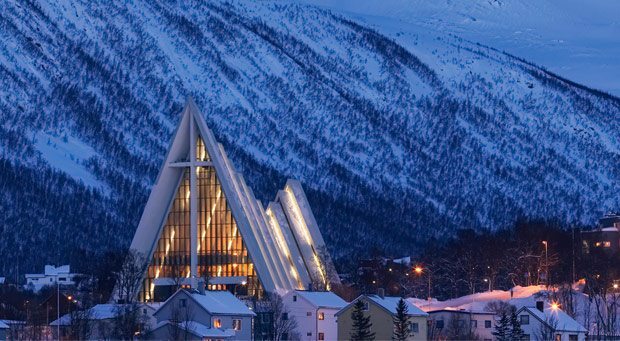 Architect Jan Inge Hovig succeeded in creating a masterpiece. 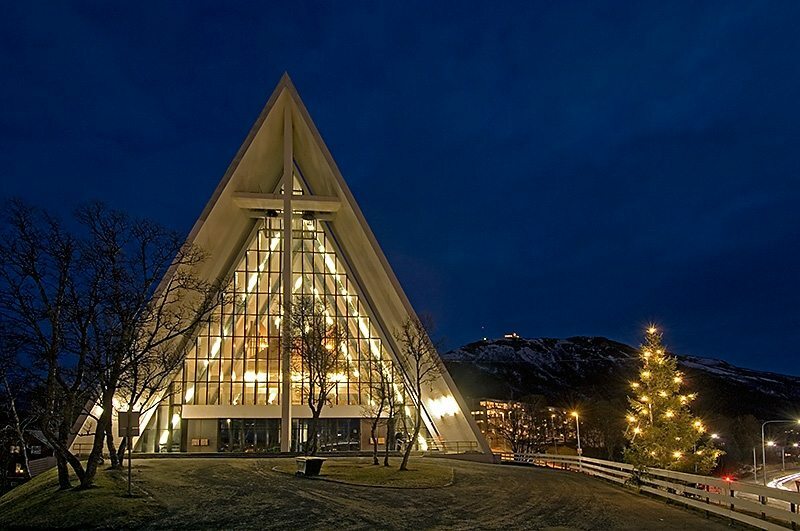 The cathedral is a landmark visible from the Tromsø Sound, the Tromsø Bridge and when landing in Tromsø by aircraft. The 11 aluminium-coated concrete panels on each side of the roof provide the cathedral’s form. The main entrance on the western side is surrounded by a large glass façade with a pronounced cross. The fantastic glass mosaic on the eastern side was added in 1972. The glass mosaic is one of artist Victor Sparre’s most prominent works. 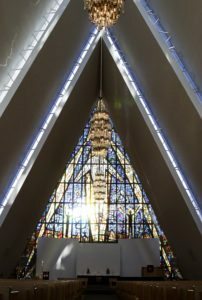 It depicts God’s hand from which departs three rays of light: one through Jesus, one through a woman and one through a man. The glass work contains many symbols and generates considerable attention among our visitors. The oak pews, the large prism chandeliers, the altar rail and pulpit are the most significant fittings, all of which are in a style that agrees with the cathedral’s severity and simplicity. The cathedral’s organ was built in 2005 by Grönlunds Orgelbyggeri. It has three manuals and pedal and 42 stops, and is built in the French Romantic tradition. The organ is adapted to the cathedral’s architecture in a masterly fashion and provides associations with sails and ice floes. The organ comprises 2940 pipes, the longest of which measures 32 feet (9.6 m) and the smallest just 5 mm. Much of the woodwork is in solid pine and the bellows are made of reindeer hide.